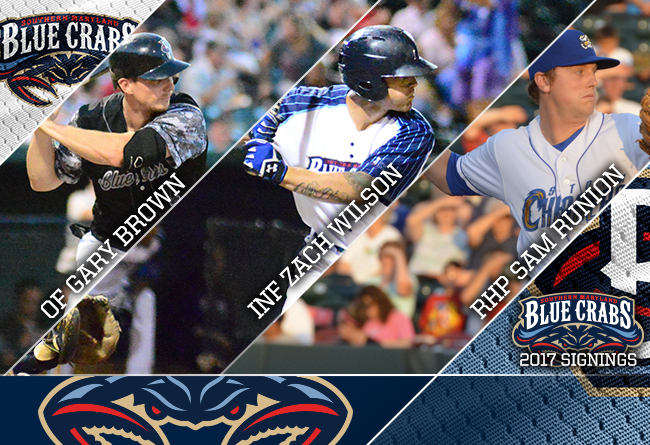 (Waldorf, Md., Feb. 2, 2017) - The Blue Crabs and first-year manager John Harris have started construction of the 10th anniversary season team with the signings of outfielder Gary Brown, infielder Zach Wilson, and right-handed pitcher Sam Runion. Gary Brown returns to Southern Maryland for a second season after posting a strong end to his Atlantic League debut campaign. The speedy outfielder hit .249 for the season. After a midseason stint on the disabled list, Brown posted a .294 batting average becoming a regular in the leadoff spot in the second half. His stellar defense became an incredible asset in center field, as the 28-year-old posted a .986 fielding percentage with only five errors. Zach Wilson returns for his third season in a Blue Crabs uniform. The infielder was named the inaugural Bill Wootan MVP Award winner presented by the Blue Crabs Booster Club. Wilson earned the title after posting a .278 batting average, while leading the team in RBI (70) and doubles (34). He played the third most games (130) in addition to being in the top three in runs scored, at-bats, hits, and home runs. The 26-year-old joined the team originally in 2015, where he primarily played first base with some time logged in the outfield. Sam Runion is a 2007 second round draft pick by the Kansas City Royals out of A. C. Reynolds High School in Asheville, NC. After a trip through the Royals organization, the 28-year-old signed with Tampa and was traded to Washington in 2014 where he played in the Nationals Class-A Advanced, AA, and AAA affiliates through the 2016 season. In 2016, the right-hander posted a 5.75 ERA in 24 games with Syracuse with a 1.389 Walks plus Hits per Innings Pitched (WHIP). This will be Runion’s first season with an Atlantic League team. The Blue Crabs play 140 regular season games in the Atlantic League of Professional Baseball Clubs. The Blue Crabs play at Regency Furniture Stadium in Waldorf, Maryland with affordable family fun. The franchise will open its 10th anniversary season on Thursday April 20, 2017. Please call 301-638-9788 or visit www.somdbluecrabs.com for more information and to reserve your seat at the ballpark today!